Make slits in the chicken in breast and thigh areas. Insert cloves and a few garlic cloves in the slits. Leave a couple of garlic cloves inside the cavity. Put all ingredients except yoghurt in a liquidizer and grind to a paste. Add yoghurt and give a quick whiz to mix it well. Adding yoghurt on previous step makes the marinade too watery. 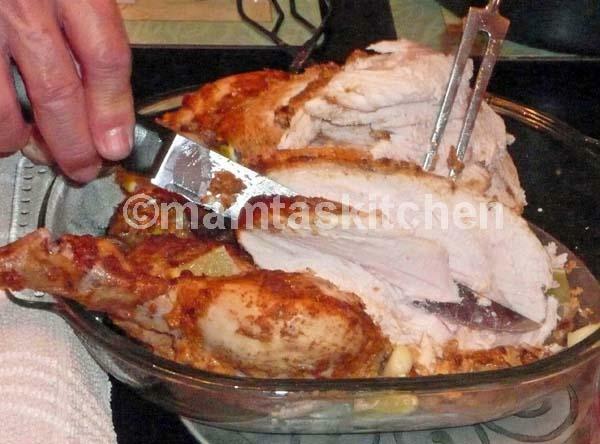 Cover the chicken all over, outside and inside, with the marinade ensuring that some enters the slits. Leave in an airtight container in the fridge overnight or at least for 3-4 hours. If it is not covered, the whole fridge will smell! Put the chicken in a roasting tin, cover with Aluminium foil and cook* in the centre of oven 200C (180C in fan oven) or 400F, Gas Mark 6 for 1 1/2 hours. Now take the foil off (keeping it covered until the last 20 minutes or so, keeps it succulent) and brown for a further 20-30 minutes at 210C or 410F, Gas Mark 7, until the surface looks nicely browned, looking crispy and charred in places, as if you have cooked it on a BBQ. Oven temperatures and performances vary, so keep an eye on the chicken the first time you cook it and work out your own time for cooking. Pour any liquid/drippings collected in the roasting tin/tray into a gravy pot and serve alongside the tandoori chicken. As chicken is skinless, this does not have much fat in it. But if there is any fat floating at the top, spoon it off. Serve with rice pulao and Mint Sauce. Also see: Tandoori Chicken 1, Tandoori Chicken 2, Tandoori Chicken 3. *Cooking times for whole chicken: At 200C; 20 minute per 500 gm plus 20 minutes extra. You may need to increase the temperature for the last 20 minutes, if you want to get the 'tandoor cooked' look. Always use full fat yoghurt, if possible. Skimmed milk yoghurt sometimes curdles during cooking.